Nah, of course I'm only messing. That whole 'camera seven' thing at the end was farcical and worthy of a laugh to start the writeup, but it was far from match-defining. Before I don the green goggles, just from a pure rugby perspective, what a cracking match of test rugby this was. Absolutely absorbing from start to finish. Perhaps you disagree, because the scoring was quite low, and if you prefer contests like the over-a-point-a-minute one served up by the Springboks and England later the same day, then that's fine, but if it wasn't for the whole 'Ireland lost' thing I could probably watch this one over and over. Yet harp on the boys in green I must, as it's kind of the whole point of this exercise. As you can see, I have steered clear of puns for this week's title because I want to focus on the way this Irish team approaches the game and the decisions we make. Many say that Joe Schmidt plays 'conservatively'. Well, he certainly did nothing of the sort at Leinster, though the argument could be made when he got control of the national team. However, it's hard to think of that as completely a 'bad thing' because success was instantaneous, with Six Nations titles in his first two years. Then, however, things started to regress a bit...we all know what happened at the RWC2015 and for a couple of years England had the ascendancy in springtime. With Joe committed to bring us at least as far as 2019, something had to be done to both improve our wider squad and also to adapt our style of play to one they all could buy into. How has it been going? All Blacks hoodoo finally lifted, and the rest of 'The Rugby Championship' nations also defeated, not all of them at the Aviva either. Oh, and then there was a Grand Slam, that got us to number 2 in the world I seem to recall? Seems like we're doing alright. Which beings us to Brisbane last Saturday. Confidence could not possibly be higher for the squad. Even the bookies, who could have easily gone with home advantage in their pre-match odds, thought we were going to shade it. So what went wrong? For me it boils down to something very simple. The type of rugby that got us this far is one that demands levels of skill and accuracy that might be at phenomenal levels, yet are still ones that you should expect if you're meant to be the second best team on the planet. Of course it's a risk to expect a virtuoso display from Joey Carbery when he knows Sexton is waiting in the wings. Or to expect your kick chasers to deal with Israel Folau under a high ball. Or to expect your forwards to protect ball carriers when the likes of David Pocock and Michael Hooper are on the pitch. Or to expect your centres to shoot out of the defensive line and avoid being hoodwinked by the footwork treachery of Kurtley Beale. It's a hell of a lot to ask. But when you've had those levels of success, haven't you earned the right to ask that of yourself? Especially when there's more success to be sought? World Cup semifinal? Dare I say final? Dare I even say winning the final? Dare I say getting the number one ranking? Well I do dare say it. Because Joe and the boys are saying it with the type of rugby they're looking to produce out there, and while of course we should be critical when needs be and don't worry I will be, overall I can't see how this project could receive anything less than our full support despite this result. Literally from the kickoff we were making statements of intent, putting down strong challenges to our opposition. Carbery took the kick, and put it short down the middle creating a contest to win the ball back. But guess what, the Wallabies and Israel Folau were up for the challenge, and not only that but they marched it back our way to earn a penalty and a 3-0 lead. OK, time to kickoff again, and of course we won't try that 'down the middle thing again, right? Wrong. Again, short and down the middle. And again, Folau took the catch. This was pretty much the pattern of the entire match. We had a seemingly endless supply of gauntlets to throw down yet Michael Cheika's men kept picking them up and smacking us about the face with them. If I had to find a real flaw in our approach it would be Joey Carbery's decision making. That may be harsh in that he would have had a playbook to execute, but that's kind of my point. If he is tagged to emerge from Sexton's shadow at some stage, it's in games like this where he needs to start doing it. Other times he seems to like taking the ball to the line himself and keeping defensive lines honest by chipping the ball over the top to himself, yet neither seemed to be on his radar on this day. That said, there some spells of play where he was doing a good job keeping us rolling forward, with some stupefying passes from himself and Conor Murray. As the Wallabies closed in there was often only one path for the ball to reach an Irish hand in support yet they kept finding it. But as it turned out, it was never to be enough to get us a five-pointer. Over and over again we were doing everything right until the very end. On four occasions we won ourselves penalties though we only converted three. Other times we were denied by the TMO with CJ named the 'culprit' both times...as you see from my intro I don't blame him for the one at the end yet although I do think he found grass with his effort at the start of the second half, he probably should have used the supporting Rob Herring who seemed to have an easier run in. Of course that was far from our only mistake on the day, and in most cases they were done by the person you'd least expect in that particular category...Henshaw missed tackles, Rob Kearney dropped an easy catch, Sexton missed a kick to touch, and at a crucial point towards the end, our experienced front row came off the bench and got pinged at a scrum close to our line which led to the decisive try from Pocock. Meanwhile the Wallabies at times were at the top of their game, especially when it came to intensity levels. Pocock stood out but there was also Beale, Folau among others. Cheika had them primed to keep us under pressure with a clever mix of crossfield kicks and quick series of long passes attempting to stretch our defence. 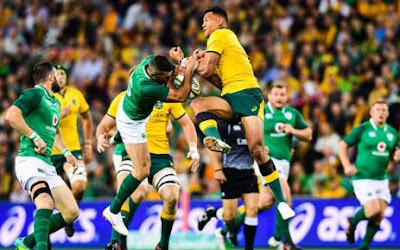 Yet they had their fair share of mistakes too, like Adam Coleman who first strayed ahead of the kicker on a restart and later was responsible for what would have been Folau's first ever try against Ireland being called back because he tackled Henderson without the ball several phases earlier. This seems as good a time as any to talk about the ref, Marius van der Westhuizen. It's best I do it this far into the writeup in case I give the impression our defeat was somehow his fault. Still, some of his decisions were baffling to say the least. We could debate all the decisions (that were contentious in both directions) all day but I just want to focus on one in particular that pretty much swung the match. The Wallabies had just nudged back ahead 11-9 and in the best of their many strong exits after restarts, they launched themselves back into our 22 on the strength of an amazing catch and offload from Folau which saw Genia kick forward towards our line. Jacob Stockdale did incredibly well, or so I thought, to take the ball and withstand the onslaught of rushing Wallabies, performing the 'release and regather' manoeuvre Leinster fans have seen James Lowe do regularly over the past season. But the ref had other ideas, penalising him because he determined a 'ruck had formed'. I have watched it several times, and I really wanted to see it, but I couldn't. The only conclusion I kept landing on was that MvdW watched him regather the ball and thought something had to be wrong with it and called the penalty, coming up with the explanation afterwards. As I rewatched this match it was with the Aussie commentary and they are known for arguing contentious calls down to the finest detail...we'll never know for sure but I reckon even they wouldn't have said a word if the ref let Stockdale play on. Let's just say that while I normally can't stand seeing players mouth off to the officials, Conor Murray's frustration after a knock on a few minutes later (when we still could have gotten back into the match) was totally understandable. But as always, we can only control what we're doing, and while we have to be disappointed with this result, the series is far, far from over. Of all the high-risk options we went for putting the gameplan together, the biggest one was the starting selection, giving something of a rest to a host of players involved in the Pro14 final, while still feeling confident of victory. For the second test in Melbourne, we have to assume Joe is 'going for it' with his best available 23 (we'll hardly have a better time to give Tadhg Beirne a run), and when the lads look back over this one they probably won't even need the coach to motivate them to get the accuracy levels back up where they should be. According to Pocock, the Wallabies can also get better...if that's the case then this could be one of the best three-match test series in recent memory, even better than the Lions last summer once we can avoid any awkward draws! One final silver lining to be found in this result...we all want our teams to win every match, but the longer winning streaks get, the more they develop into a monkey on your back. We can afford to reserve judgement of this loss until we have seen how the boys can respond in tests 2 & 3. And the same goes for the 'James Ryan unbeaten start' thing - there's certainly no harm in having that bubble burst now!